For today’s high school and college students, technological skills are more important than ever. Demand for computer science degrees has skyrocketed, with employers across industries seeking candidates who can program and code on any level. But for women, the future isn’t as bright: despite making up more than half of the workforce, only 25 percent hold jobs in technical or computing fields, and in a room of 25 engineers, only three are likely to be women. Students at Yeshiva University’s Samuel H. Wang High School for Girls (Central) are planning to change that equation. 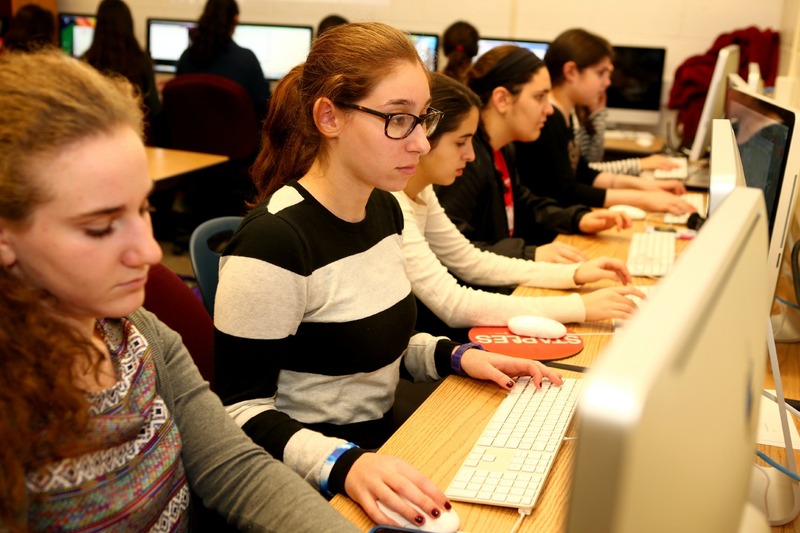 The club is led by Karoll and Rivka Apfel, a recent Central alumna earning her bachelor’s degree in computer science with a minor in physics. They draw on a full curriculum provided by the Girls Who Code organization. Once a week, students meet to learn basic coding and develop skills that will help them build anything from games and websites to their own apps. “They’ll ultimately be able to create art projects, math projects, even a shareable app or program,” said Karoll. Jessica Plotsker, a junior, is collaborating with other students to build an app that will benefit the high school. “It’s exciting,” she said. “We’re trying to create an app that will help our community.” Ultimately, Plotsker hopes to study engineering in an Israeli institution. “Coding will definitely be an important skill for my future,” she said.